Could this be Kiya ? Posted: Fri Apr 11, 2008 11:27 am Post subject: Could this be Kiya ? The fragment to the left is an unidentified "Princess" UC013 in the Petrie Museum. The one one the right, has been identified as Kiya, reworked for Meritaten. If you compare the two profiles, they are so similar that I believe the same artist carved both. Your valuable opinions and comments are very welcome ! At first glance they appear similar though it's a shame there's a crack through the left one's eye. - the lips: notice the downward line next to the mouth? I'd say this would make the model show a higher age? - the forehead: it's quite flat and straight, compared to depictions of K. or M.
I'm also not sure if the headdress would be a nubian wig - based on the original Petrie-picture. Not that such would be decisive to make it Kiya, but it would be handy. As it's an etch, I think it's quite hard to decisively tell who was the model? Th faces do look similar to me, but I doubt they really intended to make faithful portraits. The down turned mouth does remind me a bit of images of Tiye. They often associate that trait with her. The faces do look similiar, but not enough to be the same, in my opinion. The one on the left has a much pointier chin; the fleshy part of the nose looks bigger to me and the mouth also looks different. From what I can tell of the eyes they are very similiar. At first glance I might think it's Kiya, but I'm not sure. 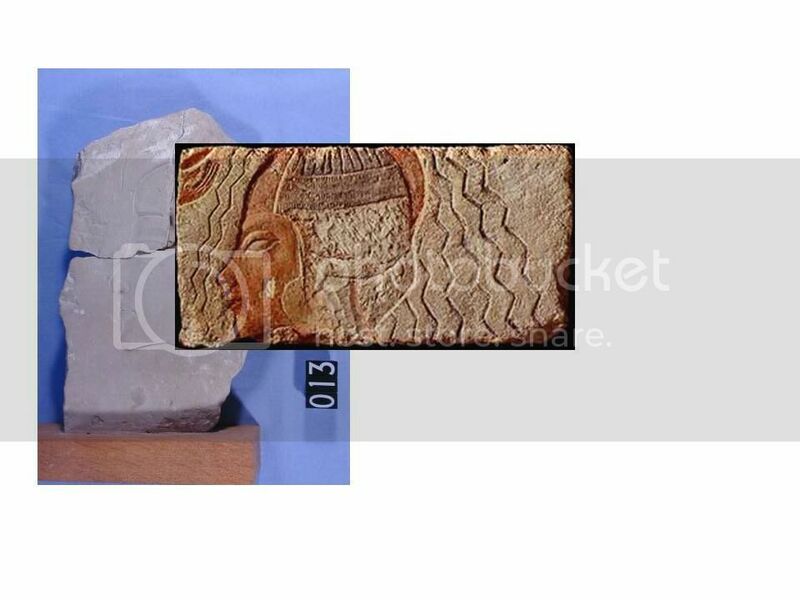 Isn't the image on the right the relief said to have been recut to portray Meritaten? Posted: Wed Apr 16, 2008 7:37 pm Post subject: Re: Could this be Kiya ? The one one the right, has been identified as Kiya, reworked for Meritaten. You can mainly tell by the headdress, the nubian wig, being reworked into the typical type of skull indeed. Notice the top of the "wig"? Apologies for repeating something that had already been said - I'm on a tiny laptop, didn't scroll right across the opening post properly, and missed the reference to Meritaten!